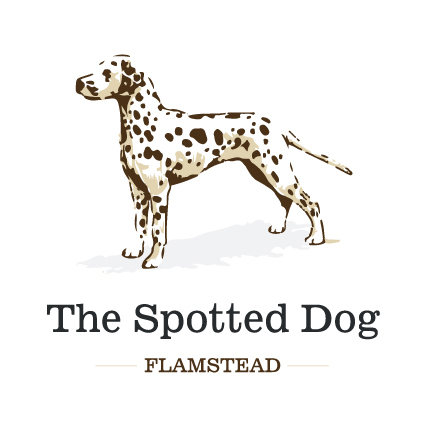 The Spotted Dog, Located on the high street in Flamstead, nestled at the end of the Chilterns with great walking from the front door. For convenience however it is just of the old roman road of Watling Street and 2 minutes from junction 9 on the slightly more modern road, the M1. Offering quality, wholesome, freshly prepared lunchtime fare and the best Sunday lunch in the area we welcome walkers, cyclists, business lunches and casual diners alike. We are dog friendly in the front bar and cope well with muddy boots! Our free-house is different from most with a immediate sense of home and comfort as you come through the door, Claire is an artist so there is much to peruse around the pub. We have a good range of quality wines, first class ales along with draft Guinness, ciders and lagers. We specialise in Gins and have one for every taste. From 8.30 each morning through to 1200 we open a wonderful cafe - called Coffeedog it has a great selection of cakes, croissant and other delights, and of course superb coffee and tea. Excellent food, delicious beer, great atmosphere and they made my labrador very welcome. What more can you ask for in a pub? Very helpful friendly pub. We celebrated a family party over lunch at a table for 12. Enjoyable lunch time. Vegetarian and gluten free diets were catered for. They did us proud. Catered for 60 guests after our memorial service. We came across The Spotted Dog after a Google search to find somewhere to meet some geographically distant friends for lunch. As soon as we walked through the door we were made welcome and were struck by the relaxed, friendly and community buzz that the owners very clearly encourage and nurture. The wonderfully tasty food and attentive whilst relaxed service added to a great lunchtime spent with our friends. We certainly plan to return again and can highly recommend. Great food and fantastic personal service. To be fair we were so early for lunch that we were al most the first customers at midday, so only(! )4 star atmosphere. Came to the first Bridge night, a bit nervous as I’m a beginner but was matched with suitable people. A really great evening (even though we lost!). Will be back next month ! Beautiful setting, delicious food, excellent service - the perfect New Years Day. Thank you. A fabulous Christmas meal with friends. Thank you. As usual, a warm welcome from Claire and an amazing dinner cooked by Tom. His roast potatoes are to die for Every course was scrumptious. Lovely Christmas dining with friends. We couldn't have asked for better, more efficient and friendly service, topped off with excellent quality food, that is very reasonably priced. We will definitely be making another visit!!! Fast and friendly service in a smart and warm environment. Spot on, The spotted dog. Lovely staff and food always delicious!! Felt cosy and like being in someone’s house. Personal service and food was delicious. Definitely return. The Spotted Dog Flamstead is our favourite Sunday Lunch stop. The food is so delicious. The staff are very natural and attentive- nothing is too much trouble. The ambiance is so relaxing we travel here often as we did on Sunday, and have never been disappointed. This family business leaves the competition  standing. If you like my review, do try it - I’m certain you will be delighted. So very pleased. Absolutely lovely. We had a most wonderful Baptism day in a welcoming, hospitable atmosphere and food - excellent.